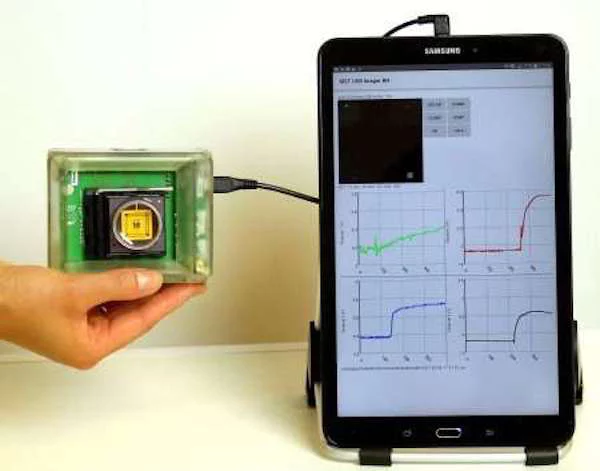 Researchers at the University of Glasgow have developed a small handheld device that can scan for biomarkers to quickly and easily diagnose people with certain diseases and illnesses. This device based on a silicon chip could help make rapid, sophisticated medical diagnostics more accessible to people around the world. 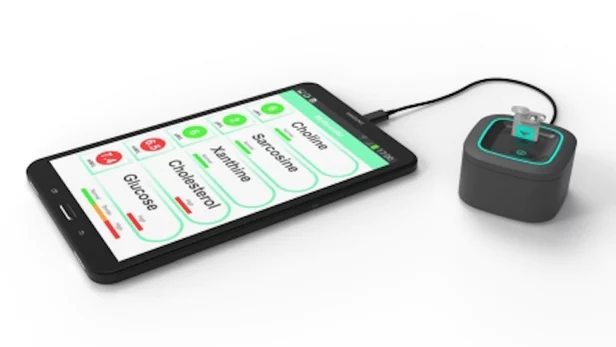 Their new device, which pairs a handheld sensor with a smartphone app, measures the levels of various metabolites in fluid samples from patients. Metabolites are small molecules found in fluids from the human body. By measuring and monitoring their relative abundance, scientists can keep track of general health or the progression of specific diseases. The ability to rapidly detect and quantify multiple metabolite biomarkers simultaneously makes this device particularly useful in cases of heart attack, cancer and stroke, where rapid diagnosis is vital for effective treatment. While metabolites can currently be measured by existing processes such as nuclear magnetic resonance and hyphenated mass spectrometry techniques, both approaches are expensive and require bulky equipment which can be slow to offer diagnostic results. The researchers’ new device is built around a new form of complementary metal oxide semiconductor (CMOS) chip. CMOS chips are inexpensive to produce and are often used in imaging devices. The chip is smaller than a fingertip and is divided into multiple reaction zones to detect and quantify four metabolites simultaneously from a body fluid such as serum or urine. The device can be operated via Android-based tablet or smartphone which provides data acquisition, computation, visualization and power. Dr. Samadhan Patil of the University of Glasgow’s School of Engineering is the lead author on the paper. He says that scientists have been able to detect and measure multiple metabolites associated with myocardial infarction, or heart attack, and prostate cancer (lat. Prostate Carcinoma) simultaneously using this device. 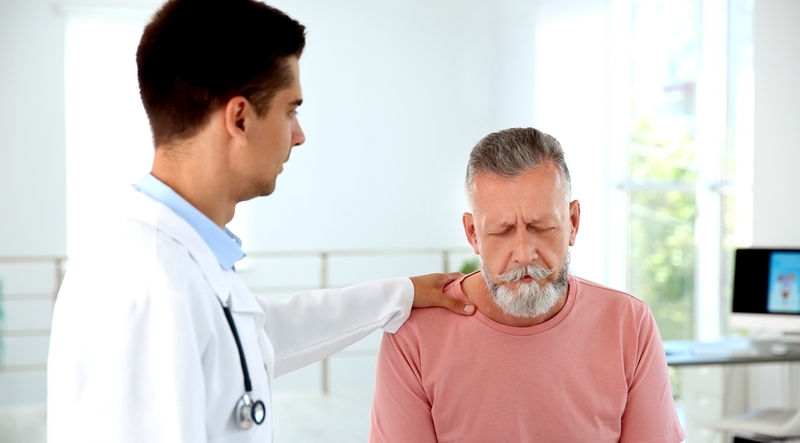 This device has the potential to track the progression of the disease in its early phase and is ideally suited for the subsequent prognosis. Handheld, inexpensive diagnostic devices capable of accurately measuring metabolites open up a wide range of applications for medicine, and with this latest development scientists have taken an important step closer to bringing such a device to market. It’s an exciting breakthrough and they are keen to continue building on the technology they have developed so far. According to Professor Mike Barrett of the University’s School of Life Sciences, co-investigator of the project, this new handheld device offers democratization of metabolomics, which is otherwise confined within the laboratory and offers a low-cost alternative to study complex pathways in different diseases. The project was supported by funding from the Engineering and Physical Sciences Research Council (EPSRC).